Exciting initiatives of CML patient organisations and professionals are again being held on World CML Day to create awareness about the needs of patients affected by Chronic Myeloid Leukemia and their families. Read here what the groups are doing around 22 September 2016! Morocco: AMAL will be the guest speaker in the national radio show in Marrakesh under the name of "Coffee and Tea" at 9:00 am on the occasion of World CML Day. AMAL has also been invited to participate in the local radio show "Cases to discuss" to cover the topic "NGO's and development" at 12:00 am. On Sept 22 AMAL is celebrating World CML Day by treating their physicians to ‘My PCR’ branded cake! #worldcmlday#mypcrBahija Gouimi. Also, don´t miss the posters developed by AMAL for World CML Day in the framework of the global "Today, Together"-campaign in 2015 and 2016! Russia: We have the same blood with "Spartacus"! Within the framework of the World Day to combat CML, WCMLD 9,22, "Fighting Fund with wall-eye" and the UK "Spartacus" are invited to the match of the 8th round of the Russian Championship ROSGOSSTRAKH "Spartak" (Moscow) - "Ufa" (Ufa).The match will be held at the stadium"Arena Opening" on September 25 at 17:00. Before the match, the players of FC "Spartak" (Moscow) will take to the field in a red cap with the inscription # SamoeVremyaZhit to support adults with blood cancer and the Charitable Foundation "Fund of struggle with leukemia» (leikozu.net). After the practical lab experience there will be an informal lecture with the lab team during refreshments. Colombia: In the face of increasing concern for the crisis within the system of Health Colombian patients with chronic myeloid leukemia (CML) and their caretakers gathered in Bucaramanga over the last weekend (Sept 17 - 18) for their first national meeting to commemorate World CML Day. With the Declaration of Bucaramanga they are making a call to the Central Government, Ministry of Health and territorial entities in order to minimize the potential risks and uncertainties for patients with CML:Declaration of Bucaramanga https://www.facebook.com/permalink.php?story_fbid=330394730647911&id=100010321595866. India: Observance of World CML Day is in full swing all over the globe. As usual, The Max Foundation team in India is in the thick of things with a number of programmes across the country. The Max Foundation and Friends of Max in India have printed posters to be given to our partners and stakeholders in our journey of the past decade and a half with CML. During the month of September we are organizing meetings all over of India (see details below); in Mumbai, Kolkata, Guwahati and Delhi where hundreds of CML survivors will gather and "Treat their physicians" to these posters celebrating their survivorship and cakes bearing the message of the importance of posing the question "What Is My PCR?". The group has joined the global campaign "Today, Together" and designed numerous posters for most target groups. Here is a summary of the different meetings held all over the country: Mumbai - 22/09/2016: Along with our partners Novartis , we have invited our patient leaders to join us in today’s event at The Max Foundation office in India . World CML Day Posters are being handed over to the team. We also have a cake with PCR and World CML Day theme. Kolkata – 22/09/2016: Launching PCR campaign on the occasion of World CML Day. World CML Day Posters are being handed over to physicians. Meeting will be having special focus on care for caregivers. Hyderabad – 22/09/2016: World CML Celebration happening at Nizam's Institute of Medical Sciences and FOM has been invited. World CML Day posters will be handed over to the physicians. The group also plans to carry a cake with PCR and World CML Day theme. Guwahati - 25/09/2016: Awareness on PCR. CML Day Posters are being handed over to physicians. We will be conducting art therapy workshop. This workshop gives hope and motivates the participants to look at the positive and colourful perspective of life. Using Art as a medium to express and share feelings of oneself through colours. Delhi – 02/10/2016: Awareness on PCR being conducted at Sir Ganga Ram Hospital. CML Day Posters are being handed over to physicians. Meeting will be having special focus on 2nd gen TKIs and highlight of the meeting will be story telling workshop. Italy: The Italian association AIL (Associazione Italiana contro le Leucemie-Linfomi e Mieloma ONLUS, www.ail.it) holds a webinar on the State of The Art in CML treatment. It will be an online meeting with lectures by CML specialists, a speaker from AIL CML Patients group and, more importantly, a Q&A session for patients and caregivers, Sept 22, 2016 at 6PM (GMT+1) accessible online: (https://engage.vevent.com/rt/ail092016~092216). ‘Cockt-AIL-Tour’ Fundraiser in Rimini: „Cockt-AIL-Competition“ Sept 21, at 15h, Embassy Club Rimini. Poster & article in local newspaper World CML Day 2016, Open Day: Rome : Ospedale S. Eugenio, aula Montalcini, 22 Sept, 15-18h. Russia: On Sept 22, 2016 at 17h the Russian Society of OncoHematology "Sodeystvie" (RSOH "Sodeystvie") will hold a meeting for patients, their relatives, friends, and the grand public: Chronic myeloid leukemia: present and future in FGBU SZFMITS them at the Almazov Center of Heart, Blood and Endocrinology", St Peterburg. Greece: On occasion of International CML Day Κ.Ε.Φ.Ι. of Athens (Association of Cancer Patients of Athens), Friends and Doctors organized a scientific workshop for members, patients, family and the public in Athens to raise awareness about the disease..
Portugal: Associação Portuguesa Contra a Leucemia (APCL) invites patients and families to register for a Q&A session on CML which will take place in their offices in Lisbon on 22nd September. Free session addressed to patients and families with limited number of seats. Testimonials of patients with CML print & AV, see: https://youtu.be/Cj-gGXUutFk. A workshop with Dr Isabel Ribeiro on ’Living with CML in the 21st Century’ was organized. USA: This year, The Max Foundation and other My PCR partners worldwide are honoring 9/22 by engaging with their physicians through the My PCR “Treat Your Physician” grant initiative. Through My PCR, partners are awarded a grant to create a My PCR themed treat to say THANK YOU to their physicians for their dedication to patients and further open patient – physician dialogues about the role of PCR testing in the monitoring of CML. Pat Garcia and Team visited the Fred Hutchinson Cancer Center in Seattle, bringing ‚My PCR’ cakes and posters. Guatemala: On Saturday Sept 17, ASOPALEU organized an event at Conquistador Hotel & Conference Center in Guatemala City. Besides interesting presentations by renowned experts, a variety of interesting workshops were offered. Philippines: Touched By Max Inc. Philippines will have four (4) projects for World CML Day 2016 to be participated in by our members: 1. All members of our Facebook group will change their profile pics to the designed awareness logo for Sept 21-23. Hashtags will also be incorporated for faster recall. 2. 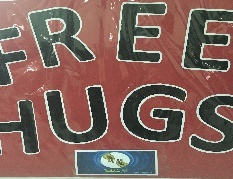 We will have a “Free Hugs” event on Sept 25. Two groups, males and females, will try to outdo each other on which group can get the most number of Hugs from the Sunday crowd at a popular place in Manila. A video will be posted at Youtube. 3. An aerobic session will be conducted for around 100 members on Sept 25 to encourage healthy living. 4. TBM members will bring Tokens of Appreciation to their doctors, a pharma group and a civic organization, in support of The Max Foundation’s “Treat your Physician”project. At the same time, we have designed 4 new posters for the World CML Day! Israel: 250 CML patients and their caregivers meet in Eilat for a 3 full day weekend to celebrate World CML Day and boost CML Awareness. Kenya: Today. Together. 22/9 World CML Day. Nairobi, Kenya. Driving more than250 kilometers around the city with CML messages on a car as way to create awareness on this important day. #todaytogether #worldCMLday2016. Thousands of people were reached in the congested streets of Nairobi. The most effective awareness campaign ever done as Henzo Kenya! Vietnam: Max´s Vie Vietnam and My PCR (http://mypcr.org/) join the global CML community to increase awareness about the need to monitor CML treatment and the right of every patient to know their test results. Thailand: MaxSmiles Thailand and My PCR (http://mypcr.org/) join the global CML community to increase awareness about the need to monitor CML treatment and the right of every patient to know their test results. Malaysia: Max Family Malaysia and My PCR (http://mypcr.org/) join the global CML community to increase awareness about the need to monitor CML treatment and the right of every patient to know their test results. We celebrate #WorldCMLDay in Penang, Johor Bahru and Kuala Lumpur. Together we celebrate our heroes in the fight against CML: Courageous patients, the dedicated doctors and also the important people working in the lab who do all the CML diagnosis and monitoring. The CML journey is more than a routine treatment, and every patient has a right to know their test results. Visit My PCR (http://mypcr.org/) a global initiative to increase awareness about the need to monitor all CML treatment. In Penang, Johor Bahru and Kuala Lumpur CML survivors visited their doctors, pathologists and their laboratory teams, expressing their gratitude by handing out ‘My PCR’ cakes. Slovenia: Six members of the Slovenian association and l & L, including Ms. Tanja Fajon, MEP (Member of European Parliament) spoke about how we are faced with a diagnosis and what is our quality of everyday life with a disease. Argentina: To celebrate the world CML Day, Asociación Leucemia Mieloide Argentina released a video on You Tube to increase awareness for Donating Blood and to sign up as volunteer donor for Bone Marrow Transplants. Victoria and Melissa, of maxargentina, visited Dr. Mariela Gomez at the Hosptal dos Clinicas and Dr. Carolina Pavlovsky at FundLeu in Buenos Aires to thank them for their work and support for the patients, and gifted a box of ‘My Pcr’ cupcakes and a WorldCMLDay poster for their support. Thank you both for everything you are doing for your patients! Turkey: Every 22th September,at World CML Day, press conference and education meeting for patients and patient’s relatives are organized by LLMBIR (Turkish Leukemia, Lymphoma, Myeloma Patients and Research Education Association Society). This year, organization was carried out in Sheraton Hotel with 100 patients and their relatives. Prof. Mustafa Yenerel was speaker as haematologist. Also, three patients with CML were speakers for sharing their experiences about CML. Spain: the Spanish Team, supported by UK-members, created a series of slides based on an online survey developed by the group asking CML patients about their treatment and the related side-effects. The responses to this survey were collected between June and September 2016 via the internet: Cutoff was Sept 12. CML patients from the US, UK, Australia, Latin America and Spain participated in this survey. Senegal: Senegal celebrated WCMLD by bringing ‘My PCR’ Cakes to Hematologists and their staff. Bangladesh: The TMF Bangladesh team visited physicians of five Hospitals (Labaid Hospital, Central Hospital, Green Life Hospital, Green View Clinic and Anwar Khan Modern Hospital) in Dhaka, distributed gifts and posters. Nepal: The Blood Cancer Society of Nepal in Patan Hospital, Lalitpur celebrated #9/22 with their physicians and volunteer leaders, gifting ‘my PCR’ cakes and WCLMD posters. Sri Lanka: Sri Lanka celebrated #9/22 with their physicians and volunteer leaders, gifting ‘my PCR’ cakes and WCLMD posters. Kosovo: The Kosovo Association for Supporting Chronic Leukemia Patients celebrated World CML Day organizing a CML Workshop on Sept 28. Serbia: The Serbian CML Association organized a CML Workshop focusing on WCMLD and ‘The Importance of Adherence’ Sept 22. at the Serbian Hematological Clinic in Belgrad. We furthermore celebrated World CML Day by organizing a workshop for all CML patients of Serbia. For the first time we had the honor to organize this event at the Clinic of Hematology, Clinical Center of Serbia, in Belgrade in their plenary room, hosted by the best hematologists who treat CML patients. The two main topics on the program: World CML Day and ‘The importance of Adherence’. The whole event was branded with the World CML Day logo and slogans, from the invitations for the event mailed to all patients by letter and distributed online, to posters and flyers distributed during on location. We were very pleased to realize that most of the patients and their family members already know about World CML Day, its meaning and importance. Also, seeing patients being able to speak directly and openly with their doctors in the clinic where they are treated was a great win to all of us. For the next few days we plan to continue to advocate for World CML Day in the online media (www.cml.rs). Azerbaijan: Charter Of "Fighting Leukemia" Public Union set up an information table at a hospital with a WCMLD poster, distributed information and flyers to raise awareness. Mexico: The TMF Mexico team visited various treating hematologists and their staff, handing out ‘My PCR’ cakes and posters. Ecuador: The Asociación Ecuatoriana de Ayuda a Pacientes con Cáncer "Esperanza y Vida" visited their doctors with 'My Pcr’ cakes to thank them for their work during the year. El Salvador: Salvadoran patientsvisited various treating hematologists and their staff at Hospital Rosales , handing out ‘My PCR’ cakes and posters. Chile: The TMF Chile team visited Dr Milanés and her staff at Hospital de Talca bringing cake and WCMLD 2016 posters. Nicaragua: The local patient organization Fundacion Alas de Vida visited physicians and brought them ‘My PCR’ cakes and other delicious gifts. We also recommend you to visit our Facebook-page! Don´t miss it! Thank you for sharing your initiatives and inspiring the community!